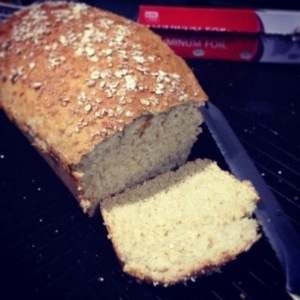 The Pseudo Artisan Baker : Honey Oat Bread | Eating Aloud! Sometimes, the urge to bake comes to me out of the blue. In this case, it was after work. Most people like to just relax and chill out after a long day. Well, me too. And sometimes baking is a way for me to relax. I used the recipe by Laura Vitale here. It is awesome! The bread is slightly buttery and sweet (from the honey, of course). And it has oats (use either rolled or quick-cooking). My breakfast for tomorrow!